30 days to personal liability for company debt/obligations. 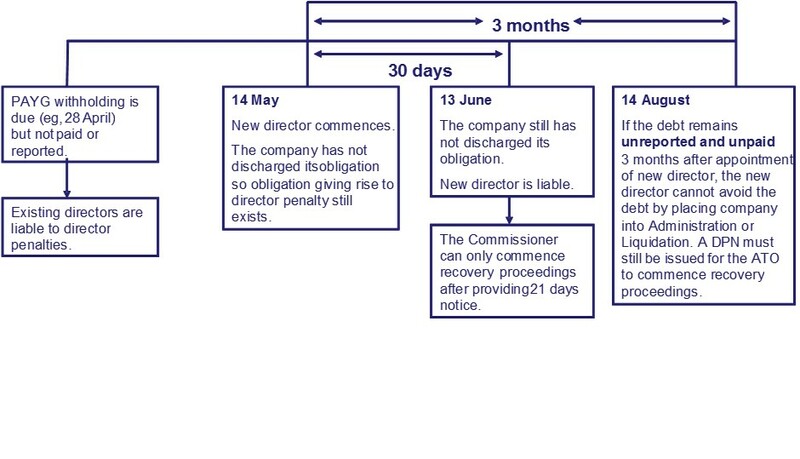 The director penalty regime, including the changes effective 29 June 2012, has been well documented. Perhaps one area not as well understood is how the regime impacts new directors who were not appointed when the company’s outstanding PAYG and superannuation obligations were incurred. It is this area of the director penalty regime that some consider is most unfair. Where the statutory lodgements were made more than three months past the due date for lodgement; that personal liability permanently “locks-down” on the newly appointed director three months after they commence as a director (i.e. the penalty cannot be remitted upon receipt of a director penalty notice). These provisions seem harsh as a newly appointed director, who in all likelihood had no involvement in the company, being exposed for conduct that occurred months or even years before their role commenced. This is particularly the case considering the position of people being volunteers on boards of directors, who derive little or no financial benefit from their appointment. Avoiding personal liability is limited to either paying the debt or causing the company to be placed into voluntary administration or liquidation, within 30 days of appointment as a new director. Adopting the view that resigning your directorship within the 30-day period will result in avoiding personal liability is flawed, as it is imposed regardless of whether the person remains as a director at the expiry of 30 days, or not. In fact, a director who resigns would find themself in a more difficult position, as they cannot then cause the company to pay the debt or influence a voluntary administrator or liquidator being appointed.